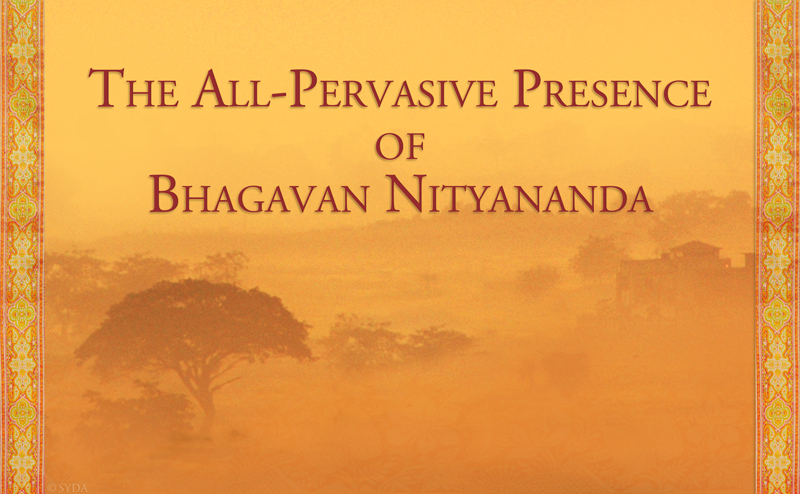 Throughout this month, we are honoring a great spiritual Master, Bhagavan Nityananda. He was a janma siddha, one who was born a Siddha, born with the awareness of himself as one with the Consciousness that pervades all creation. When a Siddha Master, such as Bhagavan Nityananda, leaves his physical body, he merges completely with supreme Consciousness. And this is why, over the years, seekers throughout the world have been able to have satsang with Bade Baba in their meditations, in their dreams, in nature, through seeing images of him, and simply by remembering him in any moment. Today we are practicing Gurumayi’s Message for 2018—Satsang—by bringing ourselves into the company of Bhagavan Nityananda, by having satsang with him. Bade Baba was a Guru who emphasized going within, to one’s innermost Self. Most of the time, he was silent. He spoke very little. Yet one word, one glance from him, or even one glimpse of him, had the power to still a receptive seeker’s mind and give that person the experience of God within. This is true even today. You have the opportunity now to listen to recordings of three stories from individuals who had satsang with Bhagavan Nityananda. These stories span many years, yet they invoke Bade Baba’s presence for us today. Before you begin listening to the stories, take a moment to refresh your posture. As you listen to each story, give it your full attention. Hold the awareness that by listening to this story, you are being invited into satsang with Bhagavan Nityananda. Now, you may listen to the first story. Gangubai’s story shows us how Bade Baba’s presence can completely transform a seeker’s inner state. By having satsang with Bade Baba, Gangubai was drawn to focus her awareness on her innermost being. The alchemy of satsang cleared away her mental unrest and led her to experience her innate stillness and peace. In Bade Baba’s silent company, she discovered the fullness of her own heart. Now, you may listen to the second story. The company of a being such as Bhagavan Nityananda can break through our limited concepts and lead us to the experience of God, of the Truth within. As is beautifully illustrated in Venkat Rao’s story, satsang with the Guru can utterly purify our perception. Opening ourselves to the Guru’s presence can give rise to a sweetness within us that we never imagined even existed—an experience of our own divinity. Now you may listen to the third story. For this Siddha Yogi, satsang with Bade Baba was a homecoming. And so it is for many seekers. By attuning to the presence of such a being, we can experience our own Truth, our own divine love, our own abundance. Remembering Bade Baba’s all-pervasive love, we can have satsang at any moment. There are so many ways we can do this—by consciously invoking Bade Baba’s presence as we perform spiritual practices, by contemplating Bade Baba’s teachings and viewing images of him, by immersing ourselves in Gurumayi’s poem A Temple Without Form, by reading Baba Muktananda’s book Bhagawan Nityananda of Ganeshpuri. And at any time throughout our day, we can simply take a moment to breathe and remember Bade Baba. His grace and blessings are infinite. His love and protection are always there for us. As we make the steadfast effort to open ourselves to the all-pervasive presence of Bhagavan Nityananda, we can come to know more fully our own divine love. 1Swami Muktananda, Bhagawan Nityananda of Ganeshpuri (South Fallsburg, NY: SYDA Foundation, 1996) p. 17. 2Swami Muktananda, From the Finite to the Infinite (South Fallsburg, NY: SYDA Foundation,1994) p. 302. It was in the 1930s that Bade Baba first came to the dense jungle area in the Tansa River Valley in the state of Maharashtra, in India. Today this same place is where his samadhi shrine is located in the village of Ganeshpuri—a village that expanded as Bade Baba’s devotees grew in number. When Bade Baba first arrived in this spot, it was heavily wooded and sparsely populated. There was, however, a Shiva temple, and here Bade Baba would sit for meditation. A young woman named Gangubai offered seva, cleaning this temple, bringing flowers and other materials of worship. Years later, when she was a very old woman, Gangubai told stories about how Bade Baba’s presence in the temple had annoyed her initially. It was a very small temple, and she had to step around this stranger to place her flowers. She was not happy about his being there. Questions went through Gangubai’s mind. Why had he had to come to this hamlet? Why did he have to come to this temple? But after days, or perhaps weeks, had passed, Gangubai began to notice that something was changing inside her own heart. She had not exchanged one word with this stranger, yet having seen him meditate each day, she now felt differently about him. Slowly and naturally, Gangubai found that as she entered the temple, the stranger’s presence no longer caused her agitation. Instead, she felt peaceful. Her heart felt light. Her mind was still. Her daily meditations were filled with tranquility. Gangubai began to see that this stranger was a holy being. As her heart opened and her meditations deepened, she began to grasp the extent of his greatness. She began to serve Bhagavan Nityananda, to welcome his grace, and to acknowledge the shifts in her heart, her mind, and her meditation. When Venkat Rao was eight years old and growing up in South India, he used to flock with his friends around a long-limbed ebony-skinned man clad in only a white loincloth. The dark man gave them chocolates to eat, stretching his hand forth into their forest of eager arms to pour a bunch of sweets into their palms. Again. And again. And again. He had no bag, no pockets, no visible store of sweets on his person. Yet he never seemed to run out of them, as they continuously poured from his hands. "He wore nothing, yet he used to give us sweets out of his hands," says Venkat Rao today. "At that time I could not explain it; I could explain only the taste of the chocolate, which was delicious." In time, Venkat Rao forgot the taste of those sweets. Indeed, as he recalled decades later, he forgot the very taste of sweetness as he went about his daily life. He became in turn a college student, an atheist, and a government officer in the Ministry of Labor when India won her independence. While thus employed, he used to travel to Mumbai on duty quite often. He was glad of this because it gave him the opportunity to see his eldest brother, Rajgopal Bhat, whom he loved very dearly and held in respect as his teacher, his guru. But Rajgopal also had a Guru—Bhagavan Nityananda. The year was 1955. Venkat Rao recalls, "To meet my brother I had to go to Ganeshpuri, because every weekend he would be there—Friday, Saturday, Sunday—and on Monday he would go directly to the office." Not only Venkat Rao’s brother, but his own wife was also Bhagavan Nityananda's devotee. He recounts, "During the holidays, when the children had vacation, my wife used to come and stay in Ganeshpuri for ten or fifteen days and be with Bade Baba. The children used to play with him. I would come only after vacation was over to take them back to Mumbai." "I never used to bow before Bhagavan Nityananda then, nor had I any great respect for him, because I felt religion was, as they describe it in Marxist philosophy, the opiate of the people. My own philosophy was that there is nothing more to life; religion is useless; do some social work. "My brother used to argue with me, of course, but I was not convinced—even though I am a brahmin and was tutored, trained, and well versed in scriptural knowledge by my father." Then, one evening, all that changed. Ganeshpuri in 1956 was much the same as it had been in 1942 when Venkat Rao first went there to see his brother. At the time there was only a big lake in front of the old Shiva Temple, along with the Bhimeshwar Temple, a mud-and-wattle hall constructed by Bhagavan himself, and little else in the way of buildings. That evening Venkat Rao slept with his family in the hall. At least, his family slept; but he, being an inquisitive type, remained awake to spy on Bade Baba through the cracks in the mud-and-wattle door. Bade Baba simply paced up and down, up and down, on the veranda outside. Venkat Rao recalls what happened next: "It must have been around two o'clock in the morning when I saw two powerful lights, like bulbs, coming from Mandagni, the mountain opposite to the temple. I saw these two powerful lights approaching the hall." "It was dark, and I strained my eyes, and eventually I could make out some animal coming. It was a leopard. There were leopards around Ganeshpuri at the time, and they came to hunt cattle. "This leopard came calmly up to Bade Baba, and sat down next to him. Then I saw Bade Baba's hand go out, and he began to stroke its head for a couple of minutes; all the time the leopard sat. And then it went back." After recovering from the surprise, Venkat Rao composed himself for sleep, believing that nothing more surprising was in store for him that night. How wrong he was. At around three-thirty he woke up. "I saw Bade Baba standing right in front of me. I noticed every detail of him, and my eyes were drawn to his fingers, which were pointing straight at the ground. I got up because I felt pulled to rise, and I looked into his eyes. "I don't know what transformation took place—I don't know what happened to me. I simply went and touched his feet. He didn’t allow anyone to touch his feet, but I touched them at that time. That was the end of all my questions, my doubts. You see, in the Bhagavad Gita, Arjuna says to Lord Krishna in the last verse, ‘All my doubts are gone. I shall do thy bidding.’ That was how it was with me." All doubts gone, from that day on love for God blossomed in Venkat Rao’s heart. It was Bade Baba who introduced me to the Siddha Yoga path in 2010. As long as I can remember, I had wanted to travel in India. I was born and reared in Germany, but I had been living and working in New York City for some time when a group of people who practiced meditation invited me to join them on a visit to India. This was exactly the kind of trip I had always wanted: an opportunity to learn about India’s culture and get to know the people. So, I traveled to India with this group of meditators. We visited so many towns: Nasik, Alandi, Pune, Tryambakeshwar. We went to lots of temples and other holy places. I began to learn about some of India’s sacred traditions—for example, approaching a deity with reverence, performing pranam to show honor and respect. The last town we visited, on the very last day before we were to fly home, was Ganeshpuri. I had enjoyed being in India for every part of this journey, but when we arrived in Ganeshpuri, I felt that this little town had something special. I was told that a powerful saint had once lived there. I went to visit this saint’s ashram. There, I walked into a covered area that was just off the main hall, and saw a daybed where this saint used to actually sit. I had an impulse to bow in honor of this saint—and not just to bow but to bow before the daybed! There I was, with my head touching the linen on this sacred daybed, and I felt what I can only call an ocean of love. Suddenly, love was flowing inside me and from me and all around me. It seemed I wasn’t flesh anymore; I was one with everything—and that everything was pulsating with an endless, generous, abundant love! I began weeping—tears of utter joy. I got up from this pranam and walked around the ashram with the others, but this feeling of love stayed with me, even after we left Ganeshpuri. When I got back to New York, it took me a long time to learn the name of this Indian saint. And even then, it took quite a while for me to understand that this saint—Bhagavan Nityananda—is part of a lineage, that this lineage is a wisdom path, that this wisdom is accessible, and that there are centers for spiritual practice on this path. It was on the internet that I learned about the Siddha Yoga Meditation Center in New York City. I was so happy! So, that winter I went to the Siddha Yoga meditation center on 29th Street. When I got there, I couldn’t see a sign on the door. I thought that the center might not even exist, and I stood in the rain, crying. Then the door opened and I could see that something was going on inside. I went in. I followed a flow of people, leaving my shoes downstairs, and then went upstairs to a big meditation hall. Walking into that hall was like coming home! There was a big picture of Bhagavan Nityananda on the wall, and I sat close to that picture. After a few visits to the center I understood that I could offer seva, and the person I spoke to about this was very friendly and welcoming. I offered seva with this woman, Judith, in the bookstore for the next three years. Just three years ago, she and I went to India together. I visited Ganeshpuri again, but this time I stayed at Gurudev Siddha Peeth and participated in a Pilgrimage to the Heart Retreat. When I look back on all of this now, I remember that sense of divine love, and I also feel immense gratitude. It was Bade Baba’s grace, the Guru’s grace, that prepared me to recognize this path that, once I had found it, would transform my life. Ian Arnold was introduced to the Siddha Yoga teachings in 2011. He serves as a writer in the SYDA Foundation Content Department, both as a home sevite and as a visiting sevite at Shree Muktananda Ashram. He also offers seva as an audio engineer and a musician at the Siddha Yoga Meditation Center in New York City. 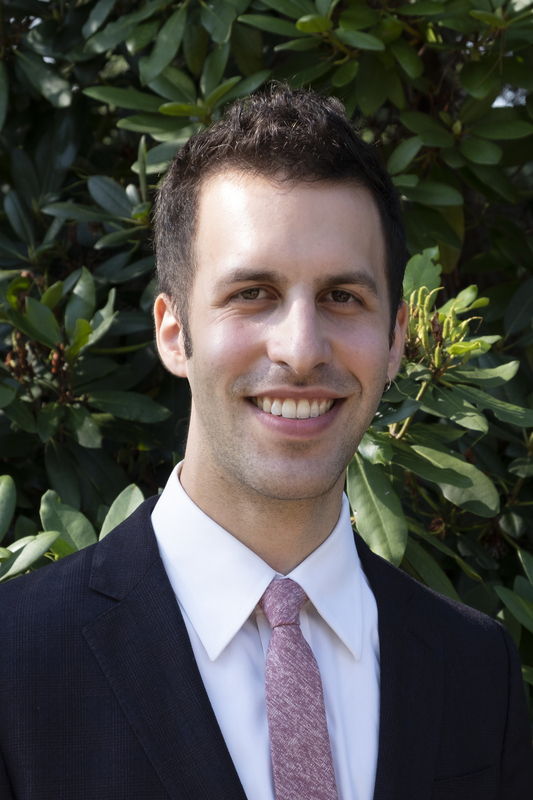 Ian holds a BA in music and consciousness studies from New York University. He lives in Brooklyn, New York, where he works as a tutor and freelance musician, composer, and writer. I love these stories of Bade Baba, and they all resonate within me. When I visited Bade Baba’s residence in Ganeshpuri and came to the stone slab that was his bed, my heart opened and tears poured out. I felt great love for and a deep connection with Bade Baba. 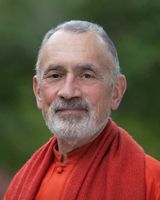 I identified with the man who was won over from doubt and skepticism to great devotion, as that was my journey as well, and now the Siddha Yoga path has graced my life and the lives of my loved ones for over 30 years. I chant to Bade Baba each morning in gratitude for his love and blessings. I place myself in his protection, and delight in knowing that only the best will come to me, whatever that looks like, and however it comes, just as the children magically received the sweets from his hands. Thank you, Gurumayi, for your love and endless blessings, and for sharing these sweet stories of Bade Baba at this auspicious time. As I listened to these stories, I experienced a deep silence. My breath was so calm that I could hear my heart beating. I felt like I was with Bade Baba and that he was taking me into the stories as though I were there experiencing them directly. Now I feel these stories are with me. I also feel Bade Baba with me. Thank you, Bade Baba, for this divine gift at this powerful time of your Punyatithi. Oh, how I love these stories! I loved hearing about Bade Baba's large open hands with fingers that pointed to the earth, the sweets he magically manifested and gave to the children, and how he stroked a leopard that sat peacefully at his side. Each vignette took me to Ganeshpuri. I recollected entering Bade Baba's household, experiencing the strong energy of the place, and seeing the old films in sepia showing him pacing on the roof. These stories of Bade Baba bring him vividly to life for me. I feel so fortunate to have found them here. I’m relating personally to each story, each so human, and to the phases of studentship that I’ve experienced myself—from atheism, disbelief, and questioning to wholehearted reverence. I’m sharing the storytellers’ transformation. I’m remembering how I too have found the sweetest love and most profound heart-opening beyond anything I would have thought possible. It is so moving to hear about Bade Baba’s power to transform the heart. Each story opens my heart to tenderness, as if I’m finding my Guru for the first time. Thank you, Gurumayi, for introducing us to Bade Baba again and again.